306sp 19 March 15 Fidget Quilt Workshops NOTE DATE CHANGE! If you plan to be present for the workshops you can bring your fidgets and fabric (cotton and pieces of varying textures) for the fronts and back with you ... and then swap with others as you woule like. You will need your sewing machine, and all accessories, including button hole foot, and threads to go with fabrics/fidgets you choose (or a neutral piecing color). If you prefer to sew at home, you might find attending one of the workshops to get information/ideas on the "what and how" so you can make a quilt and then drop it off in the store. But, if you are unable to be present, your donation of fidgets and fabric (cotton and pieces of varying textures) for the fronts and backs into the box would be greatly appreciated. SIZE: At this time, plans are for an 18" x 24" quilt. Squares cut at 6 1/2" (12 needed) OR a single piece of fabric 18" x 24", are a good planning size for the first quilt. You can pick a theme (dogs, cats, kitchen, fishing, gardening, patriotic, sports, etc) and work your fidgets around the theme ... or just go random. A piece of flannel for the backing has been found to be helpful in providing a non-skid surface on the lap. FIDGETS: are items that can be placed on a small quilt to provide activity (busywork, problem solving, activity mimic-ing Activities of Daily Living, such as tying shoes/buttoning-unbuttoning/Velcro-ing shoes, sensory input through varying textures (fabric, trims), visual interest through bright colors, fabric scenes for an individual with Alzheimer's/dementia. They can provide memory stimulation, too. SAMPLES: zippers, laces, fringe, secured buttons (large), belt rings, rick rack, empty spools of threas, Velcro, elastic, elastic hair "ties", tassels, cabone rings, ribbon, pockets (off old clothing), beads with holes to string (not type used in jewelry making), yarn, grippy shelf liner, plastic golf balls with holes, small stuffed objects/animals, pre-made appliques, plastic picture holder, belts, buckles, man's necktie, small new shoelaces, snap tape, magnetic closures, ETC. BATTING: will be available. No quilting is necessary. You can use binding or do the envelope style of completing the quilt. 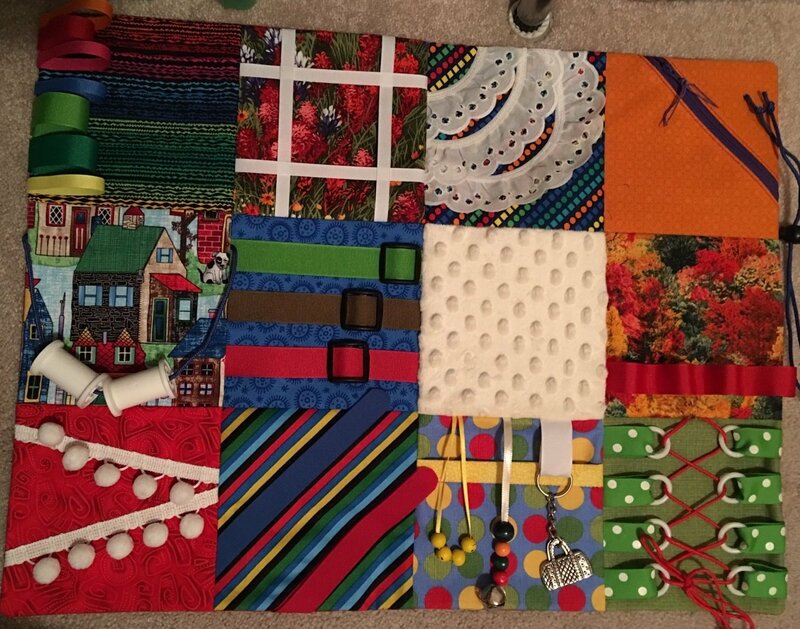 CHECK OUT: Utube, Pinterest, Etsy for "FIDGET QUILTS for dementia"